The International Space Station (ISS) appears in silhouette against the Sun in this image by Chris Newsome. Chris writes: "Either there is some dirt on the sensor of my camera or there is dirt on the mirror of the societies LX90? 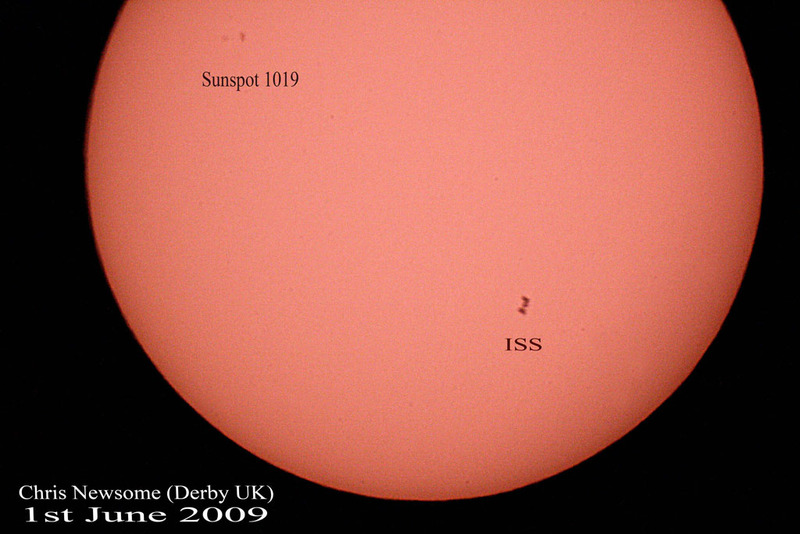 Or could it just be that while I was imaging the sun this afternoon, the ISS flew right across the face of it?! Here is the picture I captured. It was taken with a Canon 400D, Meade LX90 + solar filter, 1/250th second at 1600ASA. I took a burst of 30 frames in 10 seconds and only two had the ISS on it (it transits the face of the sun in 3/4sec!). The centreline of the transit path ran about 500m south of my location in Spondon and was bang on time at 16:00:10secs! "